Peter Jones of Edmiston & Company takes on the role of host at an open house for brokers aboard the 36.6m motor yacht Quest on Wednesday, March 31st between 3.30pm and 7:30pm at Quai 6, Berth 808 in Port Canto, Cannes. Quest was built in GRP by Italy's Benetti yard in 2009 to ABS class and MCA compliant. Her fresh and light interior by Francois Zuretti in limed oak accommodates up to 12 guests in a master, two VIP and two guest cabins along with two Pullman berths. 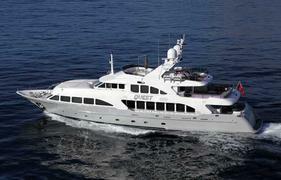 With a cruising speed of 13 knots and a range of 3,500 nautical miles at 11 knots, Quest is asking €9.75 million.